Today, we thought we'd blow your mind. Here's an interactive infographic that lets you scale up and down from atoms all the way to galaxies. It's an amazing way to appreciate the truly vast size of the Universe. 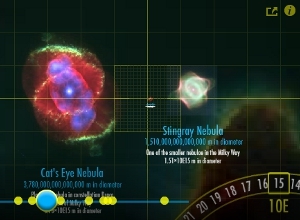 What was it like to magnify the universe? This U post is part of the month long "A-Z Challenge." For 27 days, I'll be choosing a letter from the alphabet and crafting a post around it. To read more of the posts in the series click here. To find out more about the challenge go here. I've seen other infographics such as this. They are fascinating! Great choice for the letter 'u'.